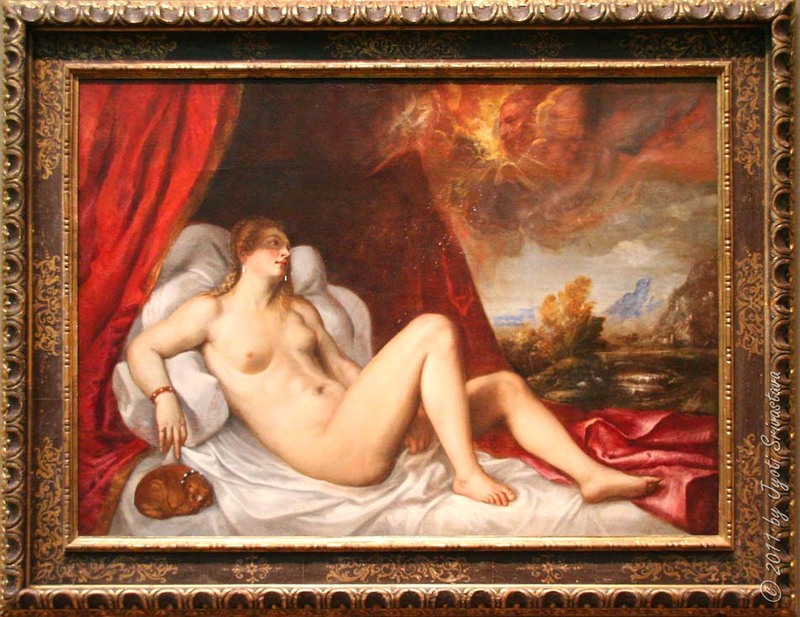 In my fine arts course this week, we did a unit on the myth of Danaë, which is admittedly only briefly mentioned in Book IV of Ovid’s Metamorphosis but has exercised a durable fascination on painters. It’s a strange scene to picture: Danaë is locked away in a futile attempt to avert prophecy, and Zeus impregnates her in the form of a shower of gold. I showed them several of Titian’s varied responses to the theme, along with paintings by Corregio, Rembrandt, Klimt, and Picasso, so we had a good balance between seeing an individual artist’s evolving responses as well as the ongoing dialogue among artists about the significance of this bizarre story. Here we have a face-to-face encounter between Danaë and Zeus, as Danaë’s white sheets are surrounded and almost overwhelmed by the contrary symbolism of rich, red tapestries. Then as now, the tiny dog was closely associated with wealthy women of low moral caliber, and her grip on the virginal white sheets has loosened, allowing her to point toward the dog with its suggestion of animal desire. Two other versions add a new figure, that of the nursemaid or attendant who presumably brings Danaë her food, etc. The nursemaid’s darker complexion contrasts with Danaë’s still-virginal white, and she is also being crassly materialistic, interpreting Zeus’s shower of gold as a shower of currency that she is trying desperately to gather. Further, when we combine the imagery of the red drapes and the dog with the nursemaid’s act of collecting money stemming from another person’s sexual act, it seems that we are being invited to view the nursemaid as a madam and Danaë as a prostitute. If we take these paintings as a progression (bracketing the question of the historical order of composition), it seems that we go from a virginal scene with a vague suggestion of love (and one-sided love at that) to a visual staging of the virgin-whore dichotomy, embodied in one figure. Presenting Danaë in this ambiguous way is far from the only possibility, as the examples of Correggio and Rembrandt show. Correggio opts almost entirely for the whore, through the redoubling of Cupid figures and the wanton pose of Danaë, while Rembrandt presents us with the “middle class” version of the story, not even explicitly showing the enigmatic sexual act. One thing that interests me about the contrast between Titian and Correggio/Rembrandt is the way the ambiguity or non-ambiguity plays out at the level of brushstrokes. 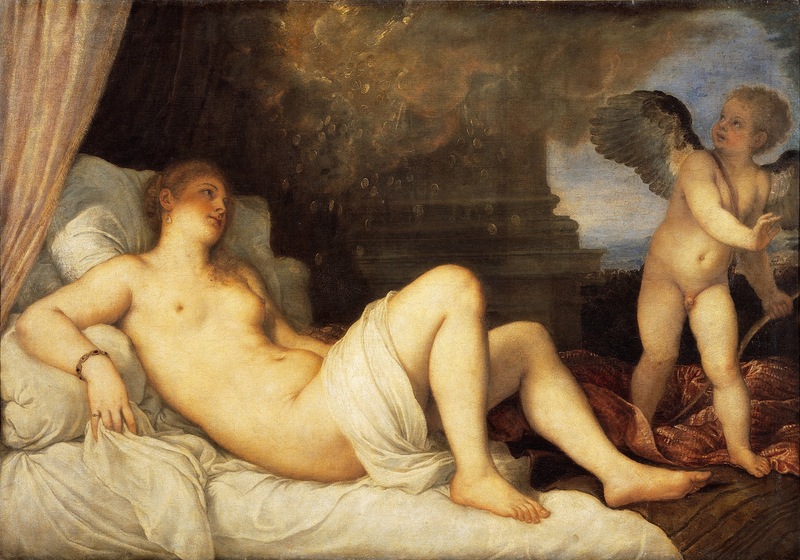 Titian is well-known for his technique of leaving visible brushstrokes, a technique that lends itself to greater ambiguity. Zoom in on Danaë’s lips in the latter two paintings, for instance — looking more closely does not resolve the question of how we are to understand her facial expression, but redoubles the ambiguity. By contrast, both Correggio and Rembrandt use clear and distinct lines and figures, with no visible brushstrokes, as befits the greater clarity of their conception. 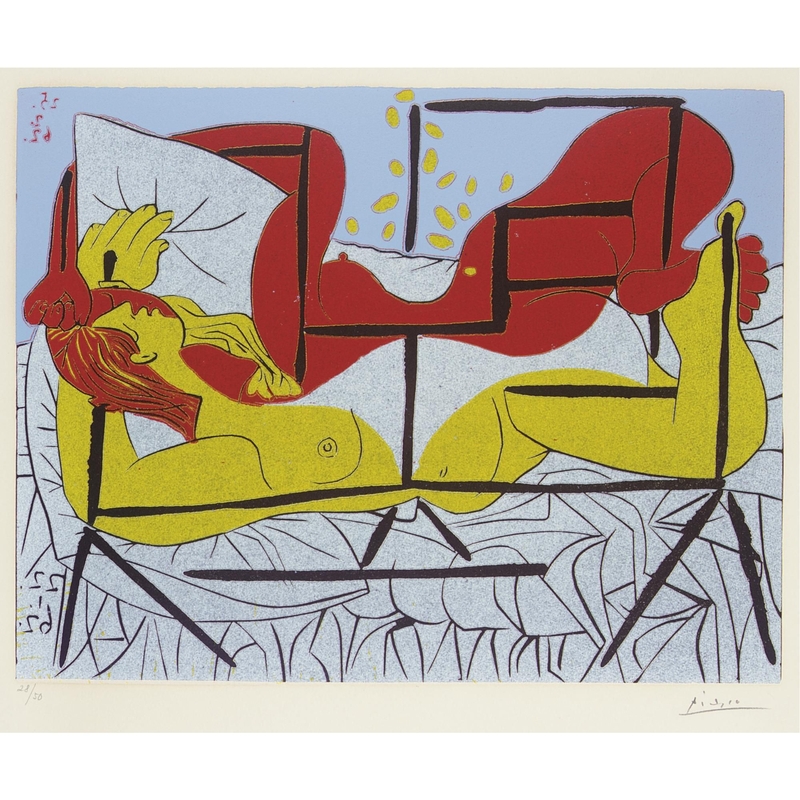 Yet clarity of line does not necessarily entail a lack of ambiguity, as Picasso’s print above illustrates. Deprived of the resources of the brushstroke, he deploys the techniques of Cubism to produce the requisite ambiguity, which is concentrated in Danaë’s face. Do the gold and red sides of her have the opposite color hair, or are the faces overlapping? And are we meant to think that her head is poking out between the bars of her cell (suggested by the thick black lines)? 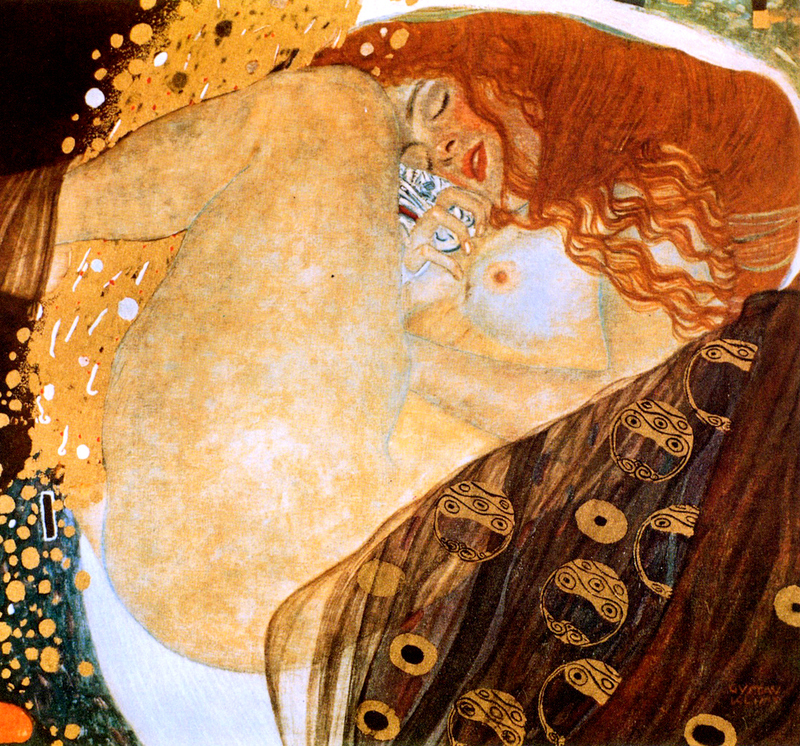 Perhaps the most striking version is Klimt’s (above). Klimt opts for an ambiguous presentation, most notably in what is not seen. Is her other leg, obscured by what has become at once an aggressive and a strangely stationary stream of gold, joined closely to the visible one in a fetal pose, or is it outspread? And where exactly is her other hand? The visible evidence doesn’t help. She could be sleeping, or could have her eyes closed for an entirely different reason. She could be clutching at her white (though not purely white) blanket or tensing her hand in ecstacy. Meanwhile the color symbolism has migrated onto her body, with the contrast of the red hair and the virginal white breast. The tightly interwoven contrasting symbolism makes Titian look almost pedantic (as Picasso arguably is in his version). In some ways, this unit shows what is best and worst in Western art. The entire theme is based on sexist ideology (with racist overtones in Titian’s presentation of the nursemaid), yet the artistic execution is impressive and fascinating, at least to me. In an inherently stationary artform, Titian, Klimt, and Picasso all produce a dynamic oscillation between two poles, mobilizing different artistic resources in each case. Svetlana Alpers claims in The Vexations of Art (which we also use in the course) that a preoccupation with the artistic medium itself can work to neutralize or immobilize violent scenes, undermining the artist’s and the viewer’s complicity with it. If she’s right, perhaps the same principle can be extended to other harmful subject matter. Perhaps there is, or at least can be, a utopian moment in an artwork that is not simply presenting or depicting something, but foregrounding the resources of art itself. Or to echo Agamben: is there a sense in which Titian et al. are turning the ideological formation of the virgin-whore dichotomy into an object of play? Possible topic for discussion: is this mythological theme a way of indirectly addressing the better-known Virgin Conception in the Western tradition and the fact that the latter figure shares her name with a prostitute?